STi Projectors w/ 6500k HID's. I purchased the car near the end of 2002, a black 2003 Subaru WRX. At the time I did not have big plans for the car, it was meant to get me to and from school and for trips up to the snow. Things quickly changed though as I started attending local meets and really got involved in the Subaru community. 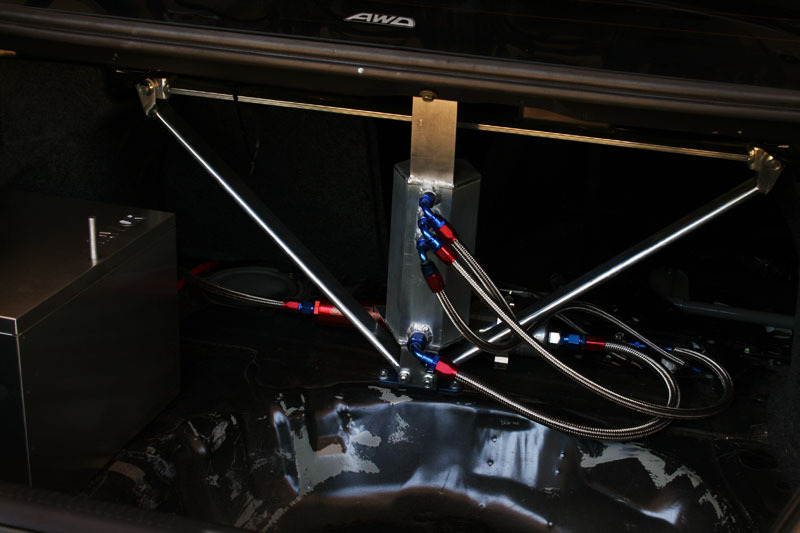 I started slowly modding the car with the basic bolt on upgrades and was content with the car. Near the middle of my senior year in highschool I had a pretty light load of classes and really started to modify the car. I did the basic vf30 turbo upgrade with all supporting mods and also followed that up with coilovers. The car was a blast on the street and handled well on the backroads. Also I had a great time working on the car and doing all of the installs myself. After running the vf30 setup for a little over a year I was eager for more power. Over the next couple of years the car went through many changes. Ranging from a stock motor ej205 with a rotated GT series turbo all the way to a full JDM V7 drivetrain swap that I installed by myself in my garage. 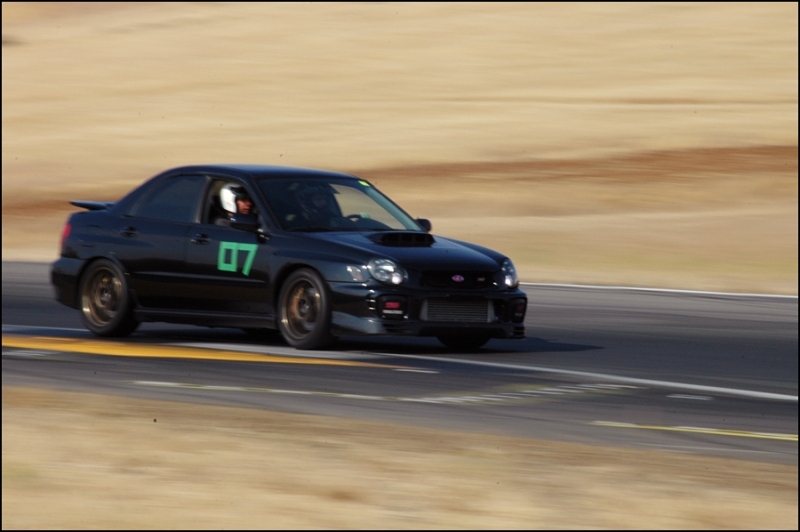 I ran the JDM V7 swap for about a year until that motor unfortunately spun a rod bearing at a track day last winter. I am now on to a new motor setup and just finished tuning it. This time I went a little crazy and fully built a 2.5 block, built the heads, and installed a larger turbo. Also I flipped the intake manifold around and fabbed up some larger intercooler pipes for it. The car recently made 484whp on Speed Elements low reading dyno dynamics dyno (570-580whp on a dynojet). The car is pretty crazy on the street now and I hope to attend a lot of track days in the near future to get the full potential out of the car. Last edited by dan avoN7; 04-09-2013 at 12:09 AM. Probably my most favourite black bugeye out there. Looks absolutely wicked. Love the wheels, really suit the car. In fact, if there is any Scoobiew that makes me want to go and spend money, its yours! Your bugeye is definetely an inspiration! Congratulations! Your car deserves it man, and having done so much work by yourself, you deserve the recognition! Dan is the man! He is seriously cool as hell and helps with me alot of stuff. Congrats on the win, it was well deserved. I can't wait until my car is your twin, well the motor/turbo setup anyway. Congrats on the win, it was well deserved. congrats man... glad to see yet another bugeye win! Well done. I love the look and spec. Great job! I love the simplicity of the car. Not overly done with "jdm" parts. Looks good, performs like a beast. congrats man...love your engine .. looks killer. favorite bugeye...period. this thing is amazing! nice work. Congrats Dan! That is oen fine Buyeye you have there my friend! BTW - Just saw that video...absolutely sick! that is one crazy subie! love it!